Looks like Dungeons & Dragons 4th edition is coming; there’s an GenCon event at 6:30 p.m., Aug. 167 in the Sagamore Ballroom. 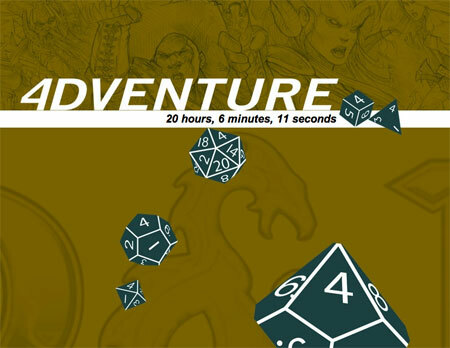 In the meantime, the Dungeons & Dragons home page is a countdown clock labeled “4Dventure”. I was at the 3.0 announcement in 1999, and that makes me want to go to this event … but not enough to blow off my Godlike event. None of us are particularly surprised by this; rumors have been swirling about 4th edition for years, and it makes a certain amount of synergistic sense to announce the new edition of Dungeons & Dragons during GenCon’s 40th year. It happens to coincide with our group’s decision to take a hiatus from D&D for a while; it could be that when we return, there might be a new edition of the game waiting for us. Will we convert? I think that depends on how backwards compatible it is, and whether or or not there is an SRD available for it. Support resources, including the SRD and a good character creator, will play a critical role on deciding to upgrade to 4th edition; if there isn’t a 4th edition equivalent of HeroForge I can’t see us upgrading us anytime soon. The teaser for D&D 4th Edition at GenCon 2007. Credit: Wizards of the Coast.